The month of love is here, and Valentine’s Day is just around the corner. If you’re still searching for the perfect date for your special someone, why not take your plans outdoors? Here are some ideas to go beyond the traditional chocolate and flowers and bring a little more outdoor Orlando magic to your Valentine’s Day. In Florida, we’re lucky to have great weather year-round—even in the winter! An outdoor movie is the perfect way to take advantage of this perk. Not only can you be cuddled up with your loved ones, but you also get the awesome experience of watching your favorite flick on the big screen. So many places around Central Florida offer free movie nights featuring a different movie each week. Grab the blankets, popcorn, and hot chocolate and check it out! Nothing says Florida outdoor adventure like walking around your favorite state park. There are so many different parks to choose from depending on what you want to do. Head over to Blue Springs State Park and take a boat ride or take a swim at Wekiwa Springs. And the nice winter weather doesn’t just mean we love be outside—the manatees are also out in full force! Head to the river to see how many gentle giants you can count. If there is one thing we can always rely on, it is a Florida sunset. People travel from all over to see our beautiful skies accompanied by our stunning beaches. Grab your favorite bottle of wine and get over to Clearwater Beach to enjoy a fun filled day and an unforgettable sunset. Throughout Orlando, there are so many parks where you can enjoy a picnic. Pack some of your favorite foods and a blanket and bring your loved one to quiet picnic in the park. Lake Lily Park is one of Orlando’s greatest spots. If you are looking for the ultimate outdoor adventures in Florida, we recommend our tree to tree adventure park. Love is literally in the air at this rope adventure park for all you thrill-seeking couples! 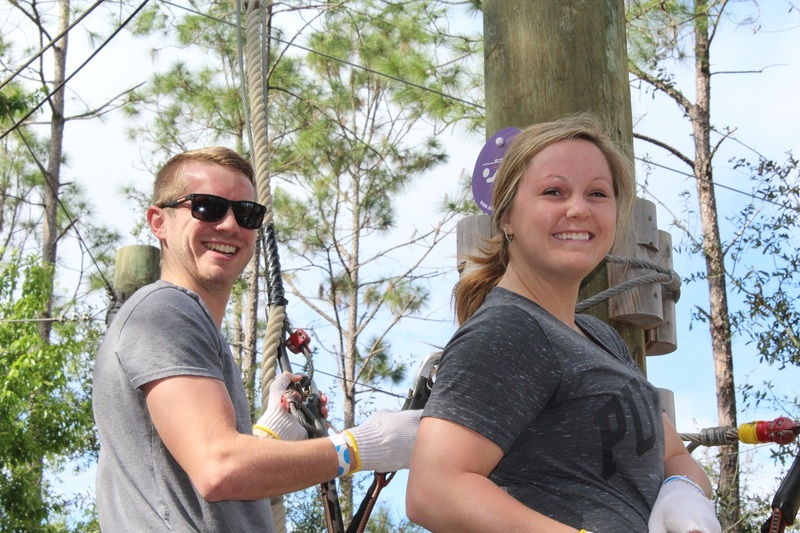 Get active and tackle fun challenges along our four aerial obstacle courses, then race through the sky as you zipline Orlando on our twin 425-foot adventure park ziplines. Our rope park will get your heart racing just as fast as your sweetheart does! Besides, nothing says romance like excitement, striking views, and time together. With so many amazing outdoor date ideas in Orlando, it won’t be hard to plan your perfect Valentine’s Day date. If this tree to tree adventure seems like the perfect date idea for you, call us at (407)-390-9999 to set up your special date for your special someone.